I grew up a Trekkie, so it’s not surprising that one of my favorite quotes comes from Nichelle Nichols, the actress who played Lieutenant Uhura in Star Trek. She said, “Science is not a boy’s game, it’s not a girl’s game. It’s everyone’s game. It’s about where we are and where we’re going.” I thank my Mines degree for helping me reach new frontiers and be all that I can be. As a proud Mines alumna, I was captivated by a recent news report highlighting a Mines milestone. Of its latest incoming freshman class, 31 percent are female. With the focus on Women in STEM careers, it was satisfying to see Mines garner this well-deserved attention as a school that seeks opportunities to attract and retain the best and brightest students, including women. New Mines president, Dr. Paul Johnson, met with our Mines Alumni Association Board of Directors to talk about his vision and goals. Foremost among those goals is student engagement and making continued progress in the recruitment and retention of qualified female students. This inspired me as a board member to seek out ways to engage our alumni and continue to “move the needle” to increase the number of women students attending and thriving at Mines. In collaboration with the President’s Office and the new admissions director, the alumni association is on track to offer opportunities to engage alumni as allies to achieve the Mines goal of attracting and retaining top female students. Several well established organizations at Mines, including Women in Science, Engineering and Mathematics (WISEM) and the Society of Women Engineers (SWE), have proven successful. These programs offer a platform to showcase our alumnae and enable them to share their experiences, successes, and journeys through Mines with incoming freshman candidates. I also checked in on the “Making the Connections” program sponsored by Halliburton, which recently hosted 70 female freshman candidates and their families on campus in a half-day session designed to foster a welcoming spirit for these prospective students. 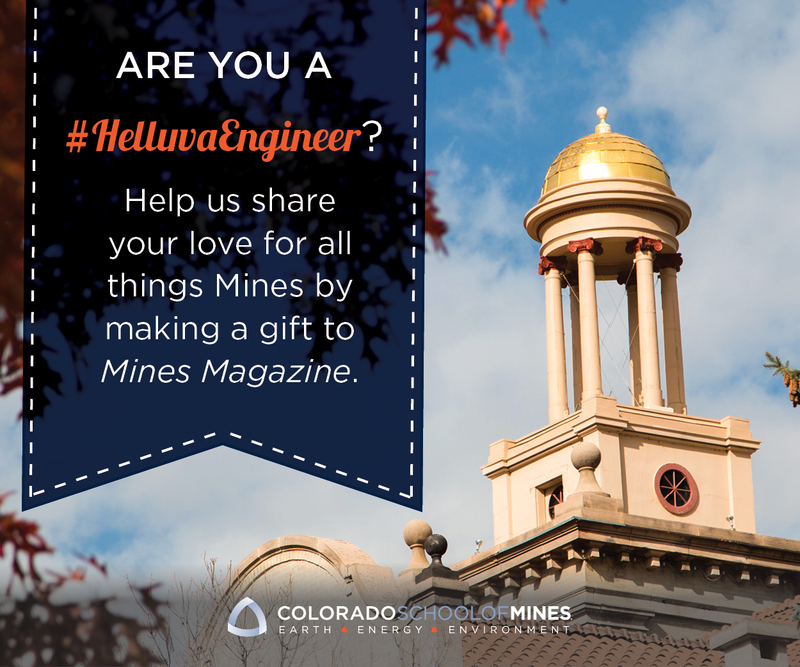 Our alumni are an important “go to” resource for Mines, and we want to provide a hub and rallying point for engagement. To that end, the alumni association is adding a new “Women at Mines” interest group, designed to communicate upcoming opportunities for our alumni to participate in a variety of programs, events, and initiatives with a lens on the female student experience. Visit the “Women at Mines” interest group at minesalumni.com/womenatmines for our upcoming “recruitment calling campaign” and additional “Making the Connections” events. We’ll make it easy for you to participate and make a profound positive impact.